Keeping the yard clean and beautiful is a must-do in every home. It is a household chore that involves the process of arranging stones, pulling out weeds, gathering up leaves and throwing waste. Yard work might get tiresome and bore most times, since the mess are not primarily caused by man, but by nature itself, making it less controllable. Thus, there is a need to maintain the yard regularly to keep it clean, green and beautiful. Given that yard work alone is tedious enough, you surely do not want to make your work heavier and more time-consuming by keeping on transferring objects from one place to another. Thus, to make yard work lighter and easier, a wheelbarrow comes in very handy and helpful. A wheelbarrow comes in different types, features, uses and prices. However, most of the wheelbarrows available in the market are quite expensive and impractical, since they are more than what you need for your yard work. Thus, if you are looking for a folding wheelbarrow that is best for household use as well as very affordable in price, then Bosmere folding Wheelbarrow is the perfect choice for you. Bosmere wheelbarrow is the best wheelbarrow you can use to make your household yard work lighter and easier. It is easy to store, has a maximum capacity ideal for household purposes, and it comes with extra storage spaces where you can place small tools and materials needed for yard work. Furthermore, Bosmere foldable wheelbarrow has amazing features that are beneficial in making your job lighter, easier and time-savvy. Thus, you should check out this amazing wheelbarrow through this review. This wheelbarrow has a maximum capacity enough to support loading and moving jobs involved in your yard work. It is durably made with its tough polyester fabric support and sturdy metal frame. It has 3 extra storage pouches at the back where you can place small and minor yard materials. Its wheels will never deflate, allowing you to use it freely in any terrain. It is foldable, making it easy to store in small storage spaces. It is the perfect wheelbarrow for household purposes, especially for yard work. It is not as heavy duty as other wheelbarrows available in the market. Its maximum capacity is quite smaller when compared to other wheelbarrows. The wheelbarrow’s tire can surely roll in any terrain, but it does not take heavy loads well. This Wheelbarrow has a maximum capacity perfect enough for yard work. This wheelbarrow has a 3.25 cubic feet capacity, making it greatly useful for loading and moving waste, weeds, leaves and other yard materials from one place to another. In addition, its capacity is enough for you to load and move light materials all at once, as much as possible. This foldable wheelbarrow has a strong support made of polyester fabric. To add to the fabric support’s toughness and sturdiness, it is also backed with PVC. Thus, you can make the best use out of this Wheelbarrow and rely on it to make your loading and moving jobs easier. This wheelbarrow has a sturdy powder-coated metal frame that adds to the strength, capacity and neat finish of the wheelbarrow. Thus, if the sturdy metal frame goes together with its tough polyester fabric support, rest assured you can make the best use out of this wheelbarrow and fully maximize its capacity. This wheelbarrow has extra storage spaces behind its polyester fabric support. It has 3 pouches at the back, which allows you to place small and minor objects and yard materials. Thus, by using this one, you can surely bring everything you need for you to do your yard work easily. Compared to others, Bosmere wheelbarrow has a solid tire that will never deflate, whether you move it through paved or quite unpaved terrains. With this wheelbarrow’s important feature, you can surely take it to make your yard work easier, no matter how muddy and rough your yard is. 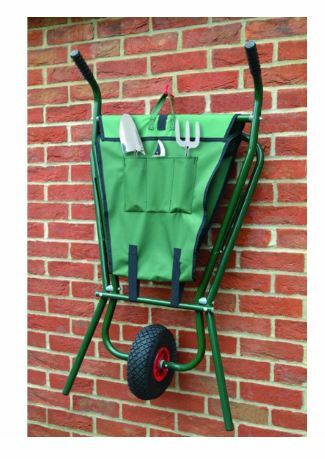 Bosmere wheelbarrow is foldable, making it easy to store and fit on narrow storage spaces. When fully folded, this wheelbarrow has a height of 45 inches and a width of 13 inches, making it easily fit into available spaces in the garage or the cabinet inside your house. If your primary reason for purchasing a wheelbarrow is to make your yard work easier, then this is the perfect one for you. This foldable wheelbarrow is primarily made and perfectly ideal for household purposes since it allows you to do the loading and moving jobs involved your yard work easily. With all the features and best benefits you can get from using this Bosmere wheelbarrow, it is surely a worthy purchase and a great bang for the buck. It is easy to store, easy to maneuver, made with quality and perfect for your household yard work. Thus, with this wheelbarrow, you absolutely won’t ask for more. Bosmere folding wheelbarrow does not need much assembly work since you just have to attach the wheelbarrow handle as well as the tire to its body. Thus, you can quickly assemble this wheelbarrow by yourself. Bosmere Wheelbarrow is for homeowners looking for the best and most affordable wheelbarrow to use exclusively for their yard and household works. 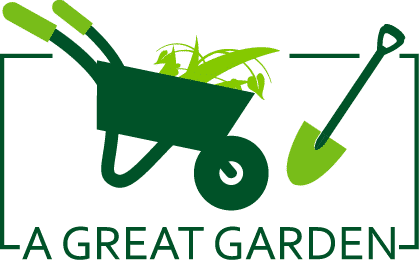 This wheelbarrow provides ease for both homeowners and gardener during yard cleaning and maintenance since it can be of great use to transfer leaves, weeds, waste and other yard materials from one place to another within garden. Q: Does this wheelbarrow easily fold up while I am trying to put objects into it? A: This wheelbarrow has a sturdy structure. Thus, it does not easily fold up while you put objects or yard materials inside it. Q: If this wheelbarrow is in a complete folded state, can I easily fit it in the car trunk? A: This foldable wheelbarrow will fit in the car trunk. If completely folded, this wheelbarrow is 45 inches high and 13 inches wide, allowing it to fit easily in the car trunk. Q: Can I load and move bagged mulch using this wheelbarrow? A: It depends on the weight of the bagged mulch you are going to load and move using this wheelbarrow. However, I suggest you do not load this wheelbarrow with heavy materials, just to keep it functional for a long time. Q: Will it be safe if I load some quite sharp yard tools in this wheelbarrow? A: I recommend you do not load sharp garden tools in this wheelbarrow. The wheelbarrow’s polyester fabric support is robust and durable. However, just to avoid it from getting torn and keep it greatly useful, avoid putting sharp yard tools inside it as much as possible. If you are looking for the best wheelbarrow to make your household and yard works easier and lighter, no doubt this Bosmere wheelbarrow is the perfect choice for you. It has a maximum capacity enough for you to do loading and moving jobs involved in your yard work in an easier manner. It is durably made with its strong fabric support and metal frame. It has extra storage pouches at the back, allowing you to put smaller but important yard objects and materials, and make the best use out of it. Besides, this wheelbarrow is foldable, making it easy to fit in small storage spaces. This wheelbarrow might not be as heavy-duty and big as other wheelbarrows, but if you are going just to use it for household purposes, it will surely be of great use and benefit to you. Use Bosmere wheelbarrow for your home, and see its best benefits for yourself.